A modification of Vigor's movement tweaks to produce a more fluid and immersive experience. Different forward run, side-step, and backwards run speeds, with relatively increased agility when using 1 handed weapons and bows. Slower movement while blocking or casting spells, making duels more dangerous (no more mindless button mashing). This is a modification of Vigor's movement tweaks that makes fighting and movement feel more natural. 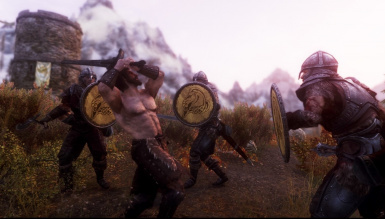 The added realism increases the complexity of fights, making them more interesting and challenging in an intuitive and balanced manner for all combat styles. This is a simple script free mod that adjusts movement speeds and the amount that one can rotate mid swing or while casting. 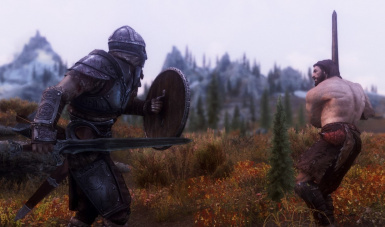 Rotational restriction might be one of the simplest and most significant improvements of Skyrim combat; without it, it's nearly impossible to dodge as NPCs will automatically spin in place. Imagine you teleport behind an NPC that's attacking you. In the vanilla game, the NPC will spin around like a ballerina and hit you. In contrast, with rotational restriction, when you execute an attack, you must aim at your target beforehand or you will likely miss, especially if you are using two-handed weapons. Compatible with all mods and combat mods, but let Athletik Combat load after combat mods or its changes may be overwritten. 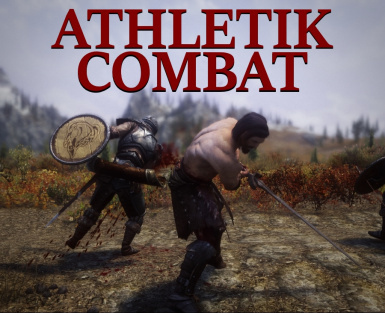 I would like to give my thanks to the authors Alx9ndre, ApolloDown, and taro8 whose mods served as the base for Athletik Combat.